Since 1964, DACOR has maintained a special memorial section at Rock Creek Cemetery in honor of those who served their country through Foreign Service. This Memorial Cemetery is designed to be a complement to that found at Arlington Cemetery which honors those who served their country through military service; the section is open to all DACOR members and their families. Nestled in a quiet corner of the bucolic Rock Creek Cemetery, located off of North Capitol Street in Washington, D.C., the DACOR Memorial Section offers a well-defined, exclusive space with both grave sites and a columbarium. A monument and a reflection area add dignity and serenity befitting the values embodied by the DACOR community. For more information send a query to dacor@dacorbacon.org. The creation of a DACOR Memorial Cemetery was proposed by Mrs. Winifred Hunter in 1957. 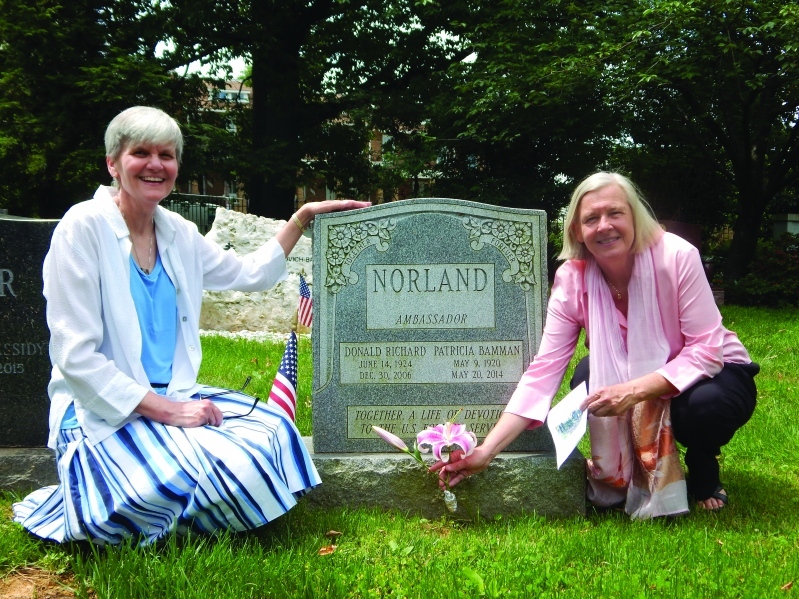 To implement her idea, a Graves Commission was appointed in 1964 and in that year it entered into a reserved-tract agreement for Section II of Rock Creek Cemetery. A similar agreement for Section I was negotiated in 1972. There are now more than 1,100 members of DACOR and their family members buried in these two areas. Following the dedication of the monument in 1973, DACOR began the tradition of placing a wreath at the monument’s base each Memorial Day. In 1984, the first Ecumenical Remembrance Service was held and the tradition of placing a small American flag at each gravesite was begun. Buried elsewhere in Rock Creek Cemetery is David Burns, II, the recorded owner from 1720 to 1780 of the lots on which DACOR Bacon House stands. Mrs. Winifred Hunter, who proposed the DACOR Memorial Area, is also buried here. Interred nearby are Sumner Wells, Under Secretary of State from 1937 to 1943; Minister Wilbur J. Carr, the “father of the Foreign Service,” and his wife Edith; and Consul General George Gregg Fuller, Executive Director of DACOR from 1954 to 1959. Minister Carr and Consul General Fuller were two of the seven members of DACOR who, in 1954, signed the Articles of Incorporation establishing Diplomatic and Consular Officers, Retired. To support members in difficult times, DACOR offers special rates for memorial services held at the House. For further information please Meg Sharley at msharley@dacorbacon.org. © 2019 DACOR. All Rights Reserved.